With countless sweaty people using gym equipment day in and day out, it’s only natural that germs will be part of the equation when you’re exercising. Fortunately, you can reduce your risk of getting sick by cleaning machines both before and after you use them. Even better, research conducted at Appalachian State University suggests that moderate exercise may even reduce your risk of upper respiratory tract infections, so you may be making yourself less likely to get sick from other people’s germs every time you work out. The right clothes for your workout are the ones you’ll actually work out in. While it might be tempting to blow your paycheck on an entirely new workout wardrobe, you’re better off saving your hard-earned money; whether you show up to the gym in your comfiest sweatpants or designer exercise gear, your clothes are going to end up sweaty and icky by the end of your workout anyway. The one thing you should pay attention to is your footwear choices: getting the right type of support for your workout of choice can help reduce your risk of exercise-related injury. There is no single “good” body type. While you may see people at the gym who have more muscle tone or less body fat than you do, they started somewhere too, and may have even had a similar body type to you at some point. Arming yourself with the right gear, like a properly-fitting sports bra and shoes with adequate support, can make all the difference in how you feel about yourself and your ability to work out. Also, don’t convince yourself that just because you’re not skinny doesn’t mean you’ll never be fit; plenty of professional athletes, from weight lifters to swimmers, are in terrific shape without being a size zero. 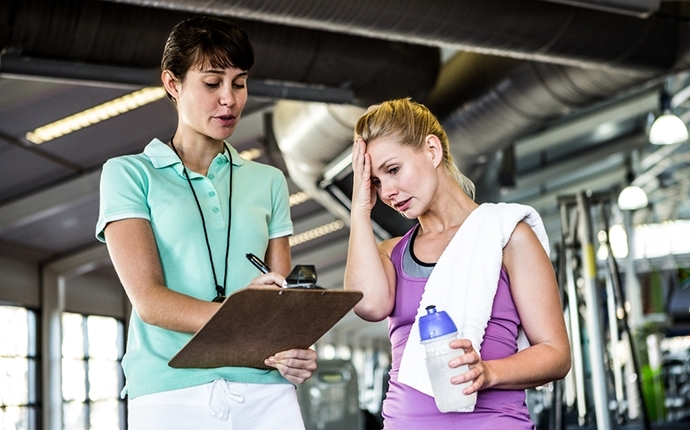 Whether you’re at school or at the gym, getting called on by an instructor can make anybody break out into a nervous sweat. Fortunately, you don’t have to subject yourself to the spotlight if you’re not interested; just tell the instructor ahead of time that you don’t enjoy getting called on and they should respect your boundaries.